For around-town commuting or fun riding, the Stromer is fast, smooth and fun. The handling is very crisp, and we like the feel of the balloon tires. The Stromer ST1 Platinum is definitely a performance-oriented commuter/tour model. The riding position straddles a line between wind cheating and comfort very well. The ride is solid and controlled if, albeit, a bit abrupt on bumps. Frame sizes are limited, but our 20-inch satisfied a lot of rider sizes. With assist, some of the dimensions that are critical on a road bike matter less. This is a high-end machine with a premium price, but the seamless and effective assist and quality components take the sting out. For serious riders, this is a serious machine with plenty of power to help. You know what they say about the Swiss: no shortage of engineering prowess, but a little on the serious side of things. As it turns out, the Swiss-designed Stromer ST1 Platinum will really only advance that reputation. Stromer was started up five years ago before it was purchased by BMC in 2011, a Swiss bike company of immense proportions who saw in Stromer the opportunity to expand their two-wheeled footprint beyond winning the Tour de France, which the BMC team did in 2010. If there was one attribute of the Stromer that stood out, it was the not-very svelte but very stout aluminum frame. To every eye that spied upon the Swiss-designed bike in the EBA office, everyone thought it could use a dose of styling. The dropouts in particular are massive, with steel inserts to ensure longevity and allow the installation of a torque sensor. We could tell that this commuter or touring bike is designed to withstand years of daily use. Stromer backed up our impressions with a full ten-year warranty on the frame and three years or 1000 charge cycles for the battery. Of course, any bicycle experience is about more than just putting in the days. 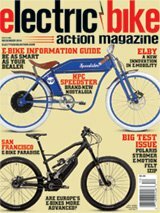 Stromer makes two versions of the bike—the Platinum and Elite—each also available with your choice of a step-through or step-over frame design, and, of course, the basis for the massive downtube is to not only provide added stiffness and stability, but most important, a home for the 36-volt, 14.5 amp-hour battery. The battery can be charged either on or off the bike. There are three chainrings on the front, but with the assist this bike offers, we rarely used the other rings. When we did, it was the middle one. You see further quality of design in the seamless interface between the rider’s pedaling and the electric assist from the 500-watt direct-drive hub motor. Like Henry Ford and the famous Model T, Stromer currently makes only one model, the ST1. Luckily, the Swiss product managers were more aware of the fickle taste of the modern consumer, so they made sure to offer a good list of options. Beyond that frame, there are also two levels of trim available. The more basic is the ST1 Elite that features a 1×9 Shimano drivetrain, a high-torque Mountain 33 motor designed for climbs, and an 11 amp-hour battery. 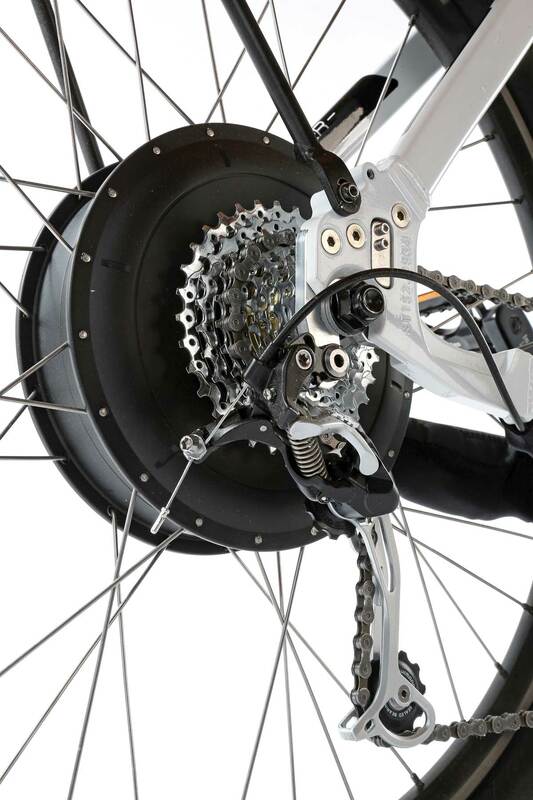 The Elite motor puts out 40 newton meters of torque, but stops adding assist at 20 mph. The ST1 Platinum uses the Power 48 motor capable of assisting up to 28 mph, but it only has 30 newton meters of torque. 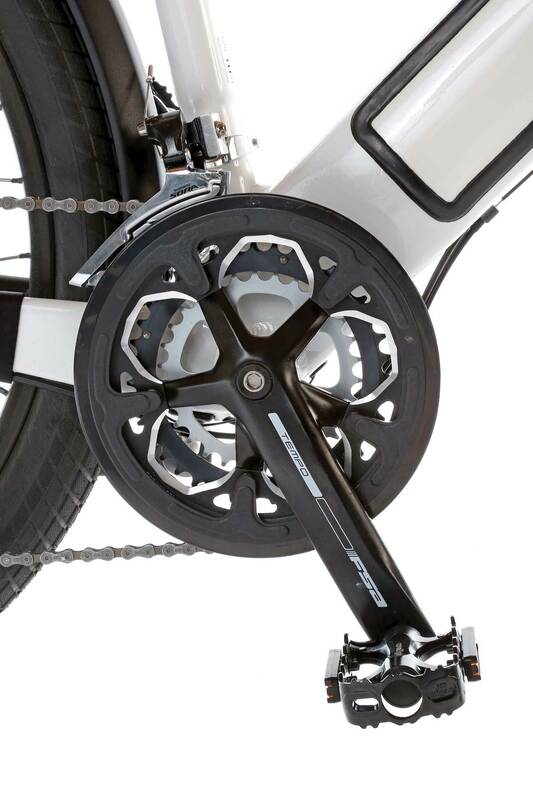 The Platinum model also has a Shimano 3×9 XT/Sora drivetrain. Stromer has kept all the models of the ST1 looking very clean with few of the wires visible. Whatever model you pick can be ordered with options. For example, our test bike came with a carbon fiber fork, but for no additional cost you can substitute a Suntour Raidon suspension fork. A further option is one of the two City kits available. The only difference between the two is the quality of the headlight. The kit includes a headlight, mini rear light, a sturdy Pletscher Optima kickstand, fenders and the Stromer Tubus rack. When we say fenders, the rear is strong enough that the rack is actually attached to the fender and then to the lugs on the frame, and it is rated to carry 22 pounds. Our test bike had the City kit, and as a result it was ready for all-weather commuting or sport. Within just a few short miles we realized how quickly we began to rely on the control display. Luckily, the system is so simple, it almost becomes complicated. There are a total of three buttons. The one on the left powers the system up, and once alive, the same button scrolls through the various screens showing mph, time, odometer, trip meter, average speed and elapsed time. Hold the button down three seconds to start. Hold it too long (roughly six seconds) and it locks the display and requires a four-digit code to turn the power back on. The two buttons on the right toggle through the modes. There are regeneration 1 and 2, no assist, eco, city, tour and power modes. 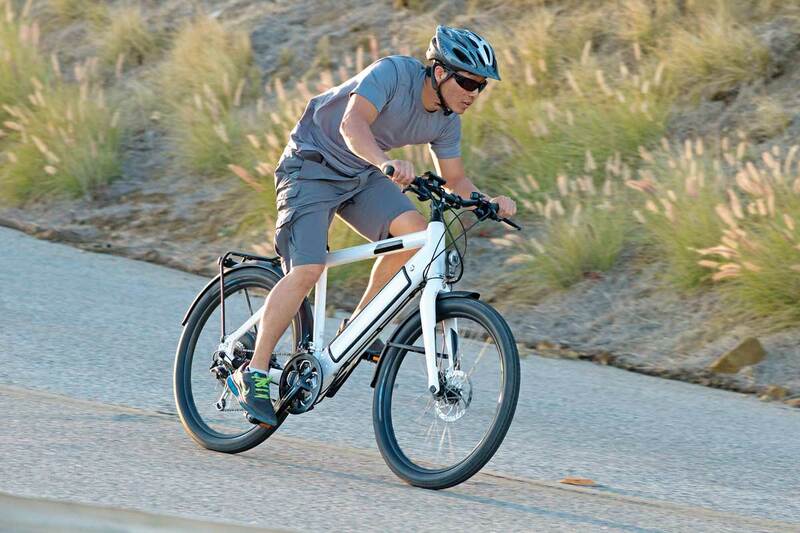 With no assist, the Stromer pedals well, but it is a 62-pound bicycle. In Eco mode, the power overcomes the weight of the bicycle and adds a little bit of assist. The ST1 uses a torque sensor in the frame, so if you’re pedaling lightly, it doesn’t feel like there’s much assist. But if you start to push harder, then there’s a noticeable increase in the assist available. In city mode, there’s noticeably more assist, and the bike is energetic and fine for any kind of flat riding, even with mild headwinds and gentle hills. The rear hub motor offers a lot of assist, but it comes in so smoothly that it doesn’t feel fast. The Shimano shifting is crisp and accurate. Those are heavy-duty drop-outs with an integrated torque sensor. As you might imagine, at those sorts of speed, you want a stable, planted platform with plenty of traction. The frame and the Magura MT2 hydraulic disc brakes are great, but we give a lot of the credit to the Stromer-specific Schwalbe 26×2:15 Big Ben balloon tires. When inflated to the max pressure of 55 psi, the tires have low-rolling resistance for such wide tires. Drop the pressure a little and enjoy the ride more. We think you’ll go with a little less than the max pressure. With the stout frame and the carbon fork, the ST1 passes a lot of the road surface through to the rider. The suspension fork makes a huge difference, but we would look into a suspension seatpost as well. On the plus side, the bike corners with supreme confidence at speed, and we hit descents that allowed the bike to hit 40 mph, and it stayed completely calm the whole time. We even spent some time on smoother dirt paths, and the tires worked well. Shifting is always crisp and instant, and even when we were machine-gunning our shifts, up or down, we never had an issue with the Shimano drivetrain. While you ride, the battery-charge indicator shows a bar graph and a percentage of charge. It also shows arrows to the right of the bar indicating how much you are draining the power. Arrows on the left of the gauge show how much regeneration power you are generating with the rear brake. You can also set the power level for regen on long descents, or even use your pedaling to charge the battery. Unlike most bikes with this feature, which kick in the regen before the brakes activate, our test bike needed a firm pull on the rear brake to indicate regen was occurring. Our road test loop has significant climbs that are misery on a normal pedal bike, but the ST1 made them easy to tackle, and we rarely dropped below 12 mph on grades if we pedaled with some enthusiasm. A 16-mile loop with over 2000 feet of climb and plenty of side- and headwinds dropped the battery level from 95% at the start to 40% at the end. We spent a fair amount of time in the power and tour modes, so we weren’t trying to stretch battery life in any way. In fact, we never shifted the front derailleur away from the 50-tooth big ring. With care and a less extreme route, the ST1 should see 30 miles of range fairly easily.